Victory Hall, in Jersey City, is open for business after being devastated by Hurricane Sandy two years ago. And the gallery opens with Drawing Off the Wall, a captivating exhibit filled with abstract art pieces. In each room you will be greeted by the everyday materials and objects the artists use to express each theme. Both established and emerging artists invite you to works they call “markedly unconventional” kinds of art. Drawing Off The Wall is being held in Victory Hall in the Jersey City. Victory Hall curators also travel around the tri-state area looking to rent out spaces in public buildings, businesses and institutions to showcase different art exhibits to the public. Victory Hall is a place where artists and the community come to connect and interact. Their main focus is on art that is innovative such as sewing, craft, and clay that wouldn’t be used in a typical art gallery. The art works are either on paper or other materials, prints, three dimensional drawings or paintings. Anne Trauben one of the artists featured in Drawing Off The Wall graduated from Tyler School of Art and Temple University in Philadelphia. Trauben created her installation out of wire forming a colony-like structure around the light and across the wall to look like lines had been drawn. “As a sculptor, I’m interested in space- how to shape it as well as capture it in an elegant, poetic and ethereal way through a process that blurs the lines between 2 and 3 dimension: drawing, sculpture, sewing and craft,” Trauben said. 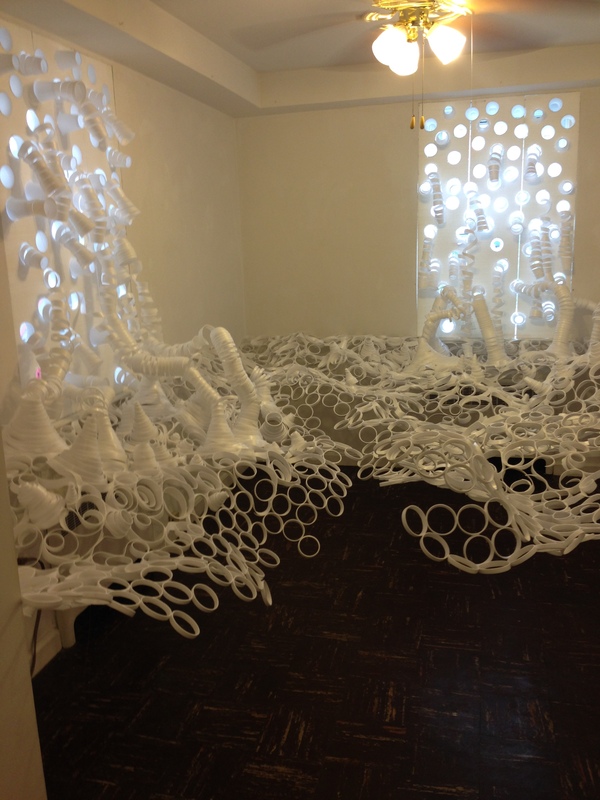 Trauben has created similar installations as the ones she displays in Victory Hall for other art exhibits. She considers her art to be abstract, because she says her sculptures blur the lines between two and three dimensions. Anne has been sculpting since she was a child. Some of her favorite artists are Eva Hesse, Louise Bourgeoise, and Petah Coyne. Her favorite places to see art is at the Guggenheim, Whitney, and Museum of Modern Art. Anne said she is inspired by nature, the body, and abstraction. Her art work is for sale in the DRAWING ROOMS and she is working on more pieces for this exhibit. Jon D. Boshart, art historian and professor at Saint Peter’s University, said today’s artists are embracing new techniques. He explains that what they did was use environmental friendly items which were going to be thrown away and used them to express their art in different ways. Drawing Off The Wall will be open from September 19 through October 26th. Victory Hall is just minutes away from New York City and has convenient art gallery hours with free admission. Previous Meet Me in Fair Lawn, New Jersey!